Held at the E. H. Stech Fieldhouse attached to West Allis Central HS which is now part of the Woodland Conference alignment. 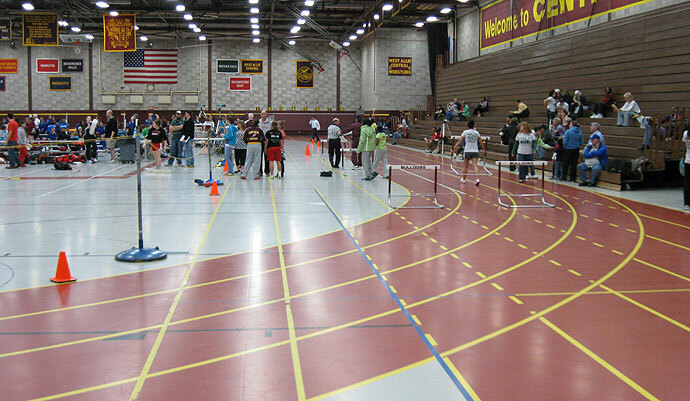 Photo courtesy of the HS Indoor facilities thread. I don’t think the Madison area kids see these types of facilities so important to note they are 160 meters in length, no spikes and slippery surfaces. Often an itchy atmosphere to breathe in here too. For whatever reason I recall the 3200 being a dreaded event on the girls side in recent years so a lot of studs forego it. Not the case in the boys. Feel free to weigh in with better translations as to what these times are worth on a 200-meter track that allows spikes. Chloe Beaudoin and Sophie Scopp finished 10th (18:49) and 22nd (19:14) at the Ridges. You’d think they’re both capable of well faster than 12:23 at this stage. It could have been a true sit-and-kick, but those seem to be pretty rare for girls. Durham was 80 and 55 seconds back of them at the Ridges (20:09, 72nd) and 10 seconds back in this race.